Following in the vein of hawker centre salad, pasta and burger stalls, Taqueria democraticises oft-pricey Mexican cuisine to the everyman with its street-friendly prices from its small Golden Shoe nook. The simple menu of handheld meals offers soft tacos four ways: chicken ($2.50), beef ($4), prawn ($3.50) and battered dory fish ($3). The chicken’s the tasty beginner option, and while we found the prawns a little bland, the battered dory fish – paired with sweet pineapples – and seared, mid-rare dices of beef are punchy, tasty options. 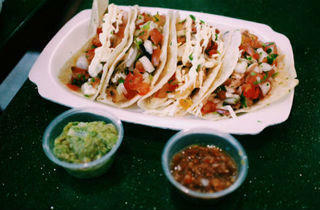 All flour tacos are made daily in-stall, as are the sour cream, guacamole ($1) and pico de gallo ($0.50) toppings that are slathered on and offered as optional extras with your order. 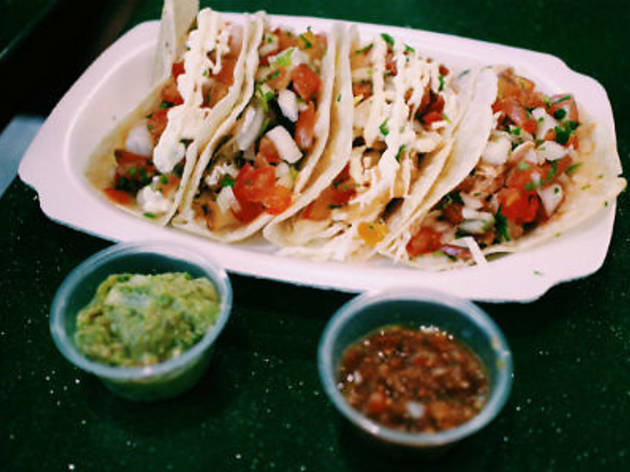 Serving sizes are little small – you might need two or three folds to fill – but at just $2.50-$4 a pop, you can well afford to pig out on the punchy tacos without quite feeling the same monetary pinch you would at MexOut, Muchachos and Lucha Loco nearby.